The last of the uses for the rear section. This time it is being pulled by the later Bedford TK cab and there seems to be a very large space behind. Anyway, this kept the money coming in from both components for a little bit longer. It appears in 1965 but has gone by 1967 so that’s quite a short life-span and these are comparatively difficult to find in good condition. Most sellers also seem to get confused and list them as 1129 or as 1141 with the old ‘Big Bedford’ cab. 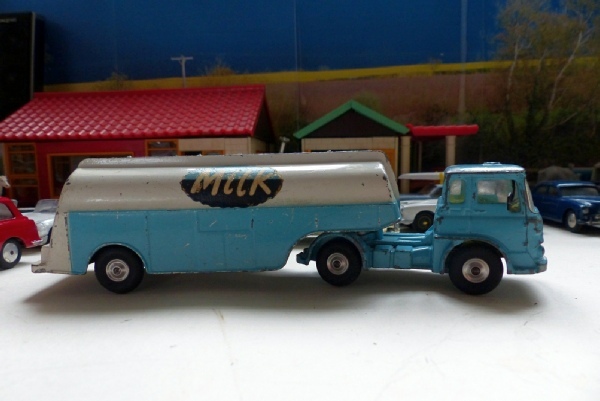 This one has a very good tanker section with stickers that are intact and very few, minor, marks to the paintwork. The cab has suffered more, though, but is still original and has good screens and the mirrors have survived. The tyres and suspension on the cab are sound too.